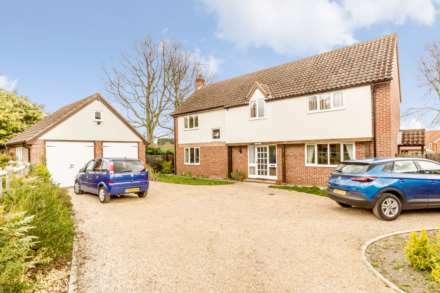 Sitting on a generous plot and situated in the popular village of Mundford, Longsons are delighted to offer for sale this substantial well presented, three bedroom detached house with two reception rooms. 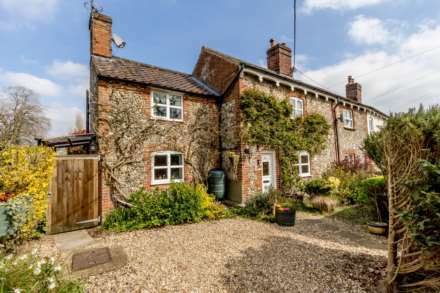 The rear garden is an absolute delight, a really good size with farmland outlook to the rear. Originally the village Police House in times gone by, the property is now a residential dwelling and viewing is highly recommended. The property offers entrance hall, lounge, dining room, kitchen, rear lobby, ground floor WC, utility cupboard, three bedrooms, bathroom, separate WC, garage, parking, gardens, UPVC double glazing and oil central heating. Mundford is a popular village and amenities include - Fish and Chip shop, village shop with butchers and Post Office combined, hairdressers, pub, village school, village hall, sports clubs, church and other facilities. UPVC double glazed entrance door to front with UPVC double glazed windows either side, stairs to first floor. Open fireplace with tiled hearth and surround, double aspect glazing with UPVC double glazed windows to front and rear, two radiators. Fitted kitchen units to wall and floor, worksurface over, stainless steel sink unit with mixer tap and drainer, integral Bosch double oven, integral ceramic hob with extractor hood over, space and plumbing for slimline dishwasher, space for slimline fridge, built-in pantry, understairs storage cupboard, oil fired central heating boiler, tiled splashback, UPVC double glazed windows to side and rear. UPVC double glazed entrance door opening to side. Obscure glass UPVC double glazed window to side, WC. Space and plumbing for washing machine, shelf with room for tumble dryer over. Built-in cupboard, UPVC double glazed window to front, radiator. Built-in cupboard housing hot water cylinder, UPVC double glazed window to rear, radiator. Bath, wash basin, tiled splashback, obscure glass UPVC double glazed window to rear, radiator. Obscure glass UPVC double glazed window to rear, WC. Concrete construction, double doors to front, window to side, electric light and power. Front garden laid to low maintenance shingle, driveway leading to garage doors, hedge and chain link fence to perimeter. Delightful, well maintained, generous rear garden with farmland outlook to the rear, landscaped with hedges as dividers into various sections, mainly laid to lawn, paved patio seating area, vast selection of shrubs, plants, conifers and ornamental trees to beds and borders, garden pond, vegetable growing area to rear, hedge and chain link fence to perimeter, two wooden garden sheds, gated access to front.